eBay released significant updates to its iPhone and iPad apps yesterday which the company says will “play an important role in eBay Mobile’s year to come.” The e-commerce platform also said that 1.8 million new customers joined eBay through a mobile device in the first three quarters of 2012, and eBay Mobile currently adds an average of 2.4 million listings per week. The iOS app updates are geared toward taking eBay’s mobile business even higher by making it easier for customers to buy and sell merchandise using their iPhone or iPad. The updates integrate mobile cameras and editing, and streamlines the listing process by making uploading photos and item descriptions more simple. 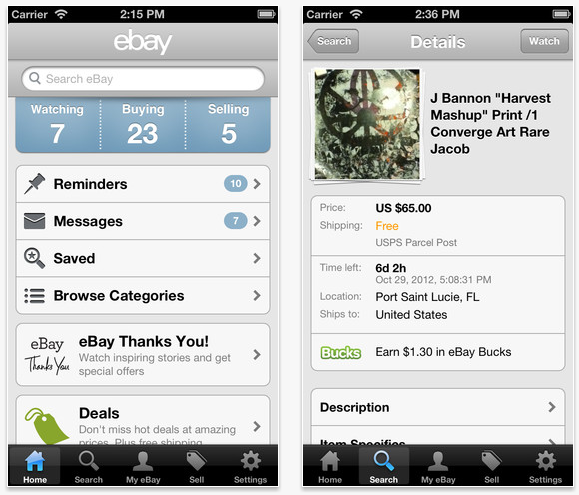 For sellers, the updated app includes new step-by-step category, pricing and shipping guidance for items listings, and the ability to save draft versions of multiple listings so sellers can start their listing on a mobile device and then finish them off on PC (helpful for vendors who want to write longer item descriptions), or vice versa. Other new features include more advanced search capabilities with auto-complete and quicker checkout. The quicker checkout allow buyers to review and confirm payments on a single screen, and gives first-time shoppers the option to pay via credit card instead of PayPal. eBay’s VP of mobile Steve Yankovich told TechCrunch last month that mobile has dramatically changed the way eBay members conduct transactions, with one out of three shoppers using their phones or tablets to browse listings even if they complete the sale on a PC. Dec. 9 was eBay’s single-biggest mobile shopping day ever, with U.S. transacted mobile volume up 133 percent from last year’s biggest mobile shopping day, Dec. 4, 2011.